He’s playing to an audience of watercolors!!! 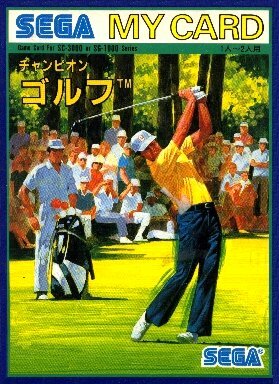 Sega also released a Card version of Champion Golf, in case you felt like wasting money twice. Playing Champion Golf is the equivalent of eating a soggy bowl of Wheaties: each has champion potential, but upon digestion, both leave you feeling empty and worthless. 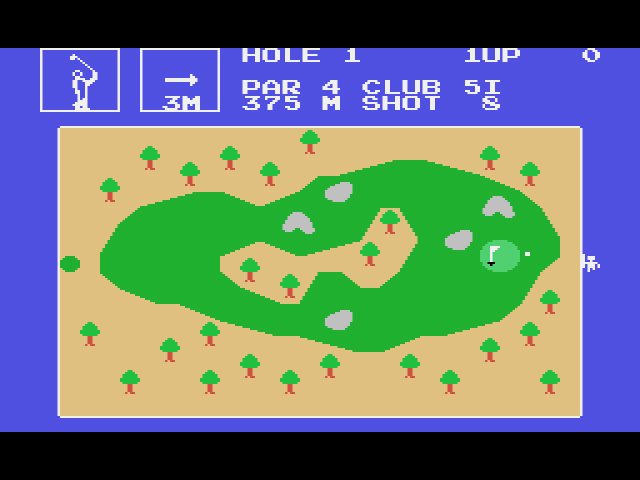 On the first hole, you’ll notice your environment: bunkers, green grass, palm trees, and a white pixel representing your ball. Like most golf games, a good shot depends on the wind, the club you choose, and the power of your swing. 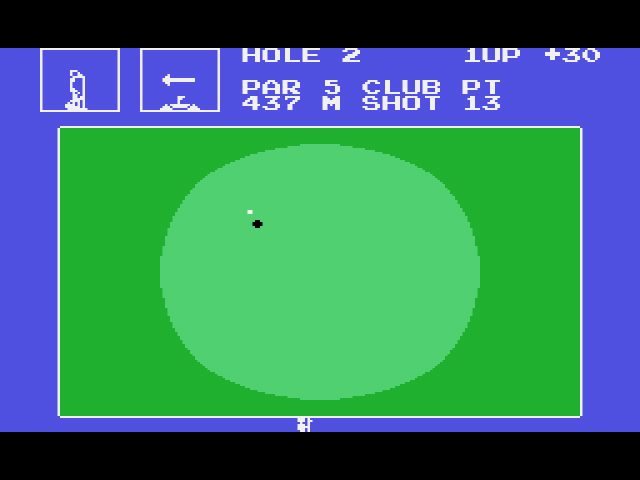 Notice the golfer encased in a white box at the top of the screen, repeatedly swinging his club back and forth like some condemned madman. His continuous swinging actually represents your power meter, and you must pay attention to the angle of his swings if you want to advance. Before you swing, however, look for a little white man (your caddie?) standing outside the borders of the course. The ball will always fly towards him, so make sure to place him in the appropriate direction. Moving him around can be tedious and confusing at times, but you grow to appreciate his tireless work ethic. As for swinging: Hit ‘II’ as the golfer raises his club and the ball will hopefully soar towards the green. Hit ‘II’ as he brings the club down, and there won’t be any strength behind the hit. It takes a few swings to get accustomed to the power meter, but you shouldn’t have any serious trouble thwacking the ball until you reach the green. For the most part, Champion Golf offers you the right club for the right shot, but not always; you don’t want to use a five-iron when you’re a few inches from the green, for example, though the game might suggest otherwise. On the holes I played, the wind was never strong enough to be a problem so I ignored it. Once you’re on the green, get your brief bits of rejoicing out of the way and don a bitter beer face: putting awaits. This shot will take at least five more strokes. Hey, I don’t make the rules. The act of putting requires a degree of subtlety that Champion Golf lacks. Based on the power meter (club goes up, club goes down), it seems there are two degrees of putting: a powerful putt that sends your ball careening across the green and a pathetic putt that barely moves the ball at all. Surely, I reasoned, there has to be a shot of moderate power between the two? Alas, I never found one, as my ridiculous +99 score on the following screenshot can attest. Unfortunately, the inability to putt properly drags an otherwise solid golf game down to the eternal bunker of despair; a place where men are forced to practice their swing until their arms detach, the dusty, stinging wind is never less than fifty miles-per-hour, and all live on a diet of faded polo shirts and soggy breakfasts of former champions. I have undoubtedly brought shame to my ancestors. 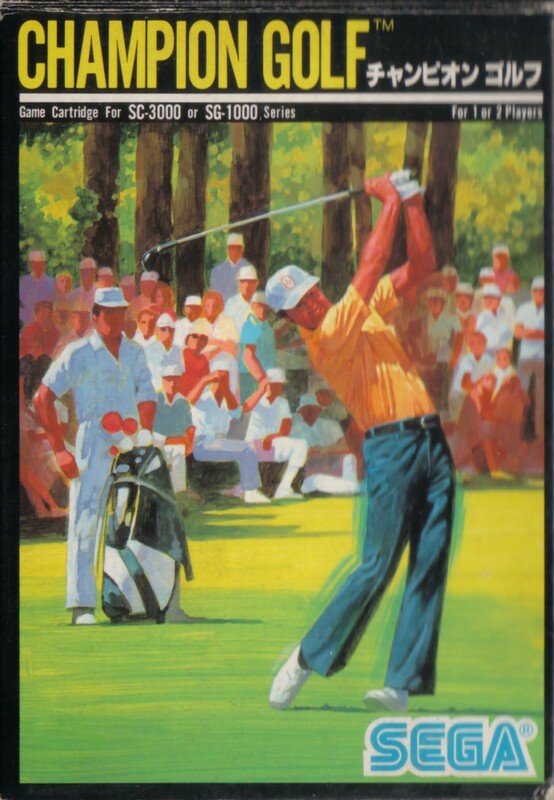 Speaking of breakfast, here’s a little ham and eggs for ya: Champion Golf is the first release in Sega’s “Champion Sports” line for the SG-1000, and the first entry in the SG-1000 library to also garner a Sega Card release in 1985. Both the SG-1000 cart and the Sega Card play exactly the same: nine holes, poor putting mechanics, potential for greatness, and so on. 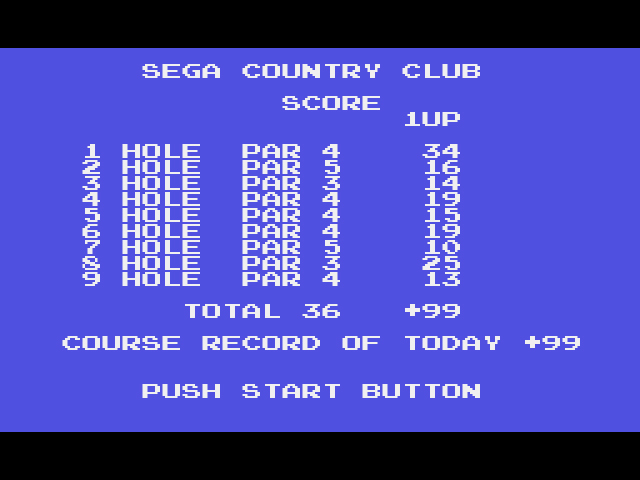 It’s unclear why Sega bothered re-releasing a sub-par golf game for a slightly different format without adding additional holes or fixing what was broken; especially considering that the Sega Card was sold for the same price as the two-year-old cartridge. Fool me once, shame on you, Sega. Fool me twice, I’ll send Arnold Palmer after you. Howdy! Long time reader, first time commenter. Just needed to pipe up with some constructive criticism of the new site: the light gray text on a white background with light blue scores doesn’t provide enough contrast and is VERY difficult to read. Headache-inducing. So much so that I’m skipping off for now after one article in hopes you address it so I can return. I should also point out that I have 20/20 vision. Any person with moderate/bad sight issues will find this impossible to read, even with large text – and web accessibility is important! Anyway, keep up the good work, but please just change the text to dark gray or black. I’m positive I’m not the only fan who feels this way. Hi Joshua! Thanks for the critique, though I’ll admit, at first I was confused. I only read the website on my home computer, and on my home computer, the background is black with white text. Turns out that, for whatever reason, the background is white (with white text) on mobile phones. Why WordPress would allow this confounds me, but I will try and resolve it today. Thanks for letting me know. Great post, to putt it politely. Looks more like gouache to me (the choice of illustrations for decades). There’s something wrong with your controller. It’s definitely possible to adjust your swing based on where the club is during the down-swing animation. I played this game for years as a kid and never had an issue with putting. Nothing wrong with my controller. Might be something wrong with my ability to play old obtuse sports games, though. Also, you had an SG-1000 as a kid?